This product is no longer available from ProVu. In combination with the AVM Fritz!Box 7270. The AVM FRITZ!WLAN USB Stick N is a fast and simple way to connect your computer to your FRITZ!Box WLAN or other WLAN networks. 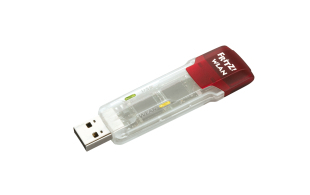 The new FRITZ!WLAN USB Stick N with AVM's unique Stick & Surf technology installs itself on the PC fully automatically. And once the stick has copied its security settings from your FRITZ!Box, no user configuration is necessary. USB WLAN client for cordless wireless networks. WLAN wireless networks according to 802.11n Draft 2.0 (300 Mbit/s), 802.11g/a (54 Mbit/s) and 802.11b (11 Mbit/s). WPA2, WPA, WEP-128 and WEP-64 encryption. 2 LEDs indicate connection and activity. Frequency range: 2.4 GHz and 5 GHz. Supports Windows Vista and Windows XP. USB bus-powered, no external power supply required.